Figure 1 Dynamic processes of proteins captured by high-speed AFM. (a) Walking myosin V on an actin filament, (b, c) Bacteriorhodopsin under dark (b) and light illumination (c) conditions, (d) rotary propagation of conformational change in rotorless F1-ATPase. See their movies. Figure 2 Roadmap of high-speed bio-SPM and bioimaging studies. Figure 3 Schematics of three types (a, SICM; b, SSVM; c, SAM) of non-contact bio-SPM and (d) SNFUH. Movie 1. High-speed AFM movies showing unidirectional processive movement of Myosin V-HMM. Imaging rate, 7 frames/s; real-time playback. Movie 2. High-speed AFM movies showing hand-over-hand movement of Myosin V-HMM. Imaging rate, 7 frames/s; real-time playback. Movie 3. High-speed AFM movie of the cytoplasmic surface of D96N bacteriorhodopsin at pH 7 during dark-illumination cycles. The green bar indicates green light illumination. Imaging rate, 1 frames/s; *10 playback. Movie 4. High-speed AFM movie of the C-terminal side of rotorless F1-ATPase in 3 μM ATP. Imaging rate, 12.5 frames/s; real-time playback. 1) T. Ando, N. Kodera, E. Takai, D. Maruyama, K. Saito, and A. Toda, “A High-speed atomic force microscope for studying biological macromolecules”, Proc. Natl. Acad. Sci. USA 98, 12468−12472 (2001). 2) T. Ando, T. Uchihashi, and T. Fukuma, “High-speed atomic force microscopy for nano-visualization of dynamic biomolecular processes”, Prog. Surf. Sci. 83, 337−437 (2008). 3) M. Shibata, H. Yamashita, T. Uchihashi, H. Kandori, and T. Ando, “High-speed atomic force microscopy shows dynamic molecular processes in photo-activated bacteriorhodopsin”, Nat. Nanotechno. 5, 208−212 (2010). 4) N. Kodera, D. Yamamoto, R. Ishikawa, and T. Ando, “Video imaging of walking myosin V by high-speed atomic force microscopy”, Nature 468, 72−76 (2010). 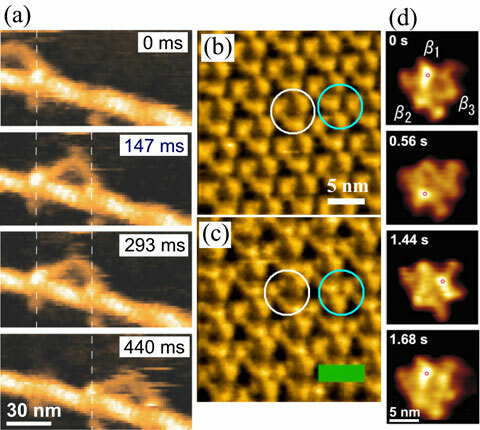 5) T. Uchihashi, R. Iino, T. Ando, and H. Noji, "High-speed atomic force microscopy reveals rotary catalysis of rotorless F1-ATPase”, Science 333, 755−758 (2011). 6) K. Igarashi, T. Uchihashi, A. Koivula, M. Wada, S. Kimura, T. Okamoto, M. Penttilä, T. Ando, and M. Samejima, "Traffic jams reduce hydrolytic efficiency of cellulase on cellulose surface", Science 333, 1279−1282 (2011). 7) G. Binnig, C.F. Quate, Ch. Gerber, “Atomic force microscope”, Phys. Rev. Lett. 56, 930−933 (1986). 8) B. Drake, C. B. Prater, A. L. Weisenhorn, S. A. C. Gould, T. R. Albrecht, C. F. Quate, D. S. Cannell, H. G. Hansma, and P. K. Hansma, “Imaging crystals, polymers, and processes in water with the atomic force microscope,” Science 243, 1586−1589 (1989). 9) W. Häberle, J.K.H. Höber, F. Ohnesorge, D.P.E. Smith, and G. Binnig, “In situ investigations of single living cells infected by viruses”, Ultramicroscopy 42−44, 1161−1167 (1992). 10) F. Ohnesorge, W.M. Heckl, W. Häberle, D. Pum, M. Sara, H. Schindler, K. Schilcher, A. Kiener, D.P.E. Smith, U.B. Sleytr, and G. Binnin, “Scanning force microscopy studies of the S-layers from Bacillus coagulans E38-66, Bacillus sphaericus CCM2177 and of an antibody binding process”, Ultramicroscopy 42−44, 1236−1242 (1992). 11) G. Binnig, “Force microscopy”, Ultramicroscopy 42−44, 7−15 (1992). 12) M. B. Viani, E. T. Schäffer, A. Chand, M. Rief, H. E. Gaub, and P. K. Hansma, “Small cantilevers for force spectroscopy of single molecules”, J. Appl. Phys. 86, 2258−2262 (1999). 13) M. Kitazawa, K. Shiotani, and A. Toda, “Batch fabrication of sharpened silicon nitride tips”, Jpn. J. Appl. Phys. 42, 4844−4847 (2003). 14) J. H. Kindt, G. E. Fantner, J. A. Cutroni, and P. K. Hansma, “Rigid design of fast scanning probe microscopes using finite element analysis”, Ultramicroscopy 100, 259−265 (2004). 15) T. Ando, T. Uchihashi, N. Kodera, A. Miyagi, R. Nakakita, H. Yamashita, and K. Matada, “High-speed AFM for studying the dynamic behavior of protein molecules at work”, e-J. Surf. Sci. Nanotechnol. 3, 384−392 (2005). 16) T. Fukuma, Y. Okazaki, N. Kodera, T. Uchihashi, and T. Ando, “High resonance frequency force microscope scanner using inertia balance support”, Appl. Phys. Lett. 92, 243119 (3 pp) (2008). 17) N. Kodera, H. Yamashita, and T. Ando, “Active damping of the scanner for high-speed atomic force microscopy”, Rev. Sci. Instrum. 76: 053708 (5 pp) (2005). 18) M.B. Viani, T.E. Schäffer, G.T. Paloczi, L.I. Pietrasanta, B.L. Smith, J.B. Thompson, M. Richter, M. Rief, H.E. Gaub, K.W. Plaxco, A.N. Cleland, H.G. Hansma, and P.K. Hansma, “Fast imaging and fast force spectroscopy of single biopolymers with a new atomic force microscope designed for small cantilevers”, Rev. Sci. Instrum. 70, 4300−4303 (1999). 19) N. Kodera, M. Sakashita, and T. Ando, “Dynamic proportional-integral-differential controller for high-speed atomic force microscopy”, Rev. Sci. Instrum. 77, 083704 (7 pp) (2006). 20) T. Ando, "High-speed atomic force microscopy coming of age", Nanotechnology 23, 062001 (27 pp) (2012). 21) T. Uchihashi, N. Kodera, and T. Ando, "Guide to video recording of structure dynamics and dynamic processes of proteins by high-speed atomic force microscopy", Nat. Protocols (in press). 22) I. Casuso, P. Sens, F. Rico, and S. Scheuring, “Experimental evidence for membrane-mediated protein-protein interaction”, Biophys. J. 99, L47–L49 (2010). 23) P.-E. Milhiet, D. Yamamoto., O. Berthoumieu, P. Dosset, Ch. Le Grimellec, J.-M. Verdier, S. Marchal, and T. Ando, “Deciphering the structure, growth and assembly of amyloid-like fibrils using high-speed atomic force microscopy”, PLos One 5, e13240 (8 pp) (2010). 24) Y. Shinozaki, K. Sumitomo, M. Tsuda, S. Koizumu, K. Inouem, and K. Torimitsu, “Direct observation of ATP-induced conformational changes of single P2X4 receptor/channel”, PLoS Biol. 7, e1000103 (9 pp) (2009). 25) S. F. J. Wickham, M. Endo, Y. Katsuda, K. Hidaka, J. Bath, H. Sugiyama, and A. J. Turberfield, “Direct observation of stepwise movement of a synthetic molecular transporter”, Nat. Nanotechnol. 6, 166−169 (2011). 26) T. Ando, T. Uchihashi, and N. Kodera, “High-speed atomic force microscopy”, Jpn. J. Appl. Phys. (in press). 27) T. Fukuma, T. Ichii, K. Kobayashi, H. Yamada and K. Matsushige, “True-molecular resolution imaging by frequency modulation atomic force microscopy in various environments”, Appl. Phys. Lett. 86, 034101 (3 pp) (2005). 28) T. Fukuma, K. Kobayashi, K. Matsushige, and H. Yamada, “True molecular resolution in liquid by frequency-modulation atomic force microscopy”, Appl. Phys. Lett. 86, 193108 (3 pp) (2005). 29) B. W. Hoogenboom, H. J. Hug, Y. Pellmont, S. Martin, P. L. T. M. Frederix, D. Fotiadis, and A. Engel, “Quantitative dynamic-mode scanning force microscopy in liquid”, Appl. Phys. Lett. 88, 193109 (3 pp) (2006). 30) T. Fukuma, M. J. Higgins, and S. P. Jarvis, “Direct imaging of lipid-ion network formation under physiological conditions by frequency modulation atomic force microscopy”, Phys. Rev. Lett. 98, 106101 (4 pp) (2007). 31) H. Asakawa, K. Ikegami, M. Setou, N. Watanabe, M. Tsukada, and T. Fukuma, Submolecular-scale imaging of α-helices and C-terminal domains of tubulins by frequency modulation atomic force microscopy in liquid ”, Biophys. J. 110, 1270−1276 (2011). 32) T. Fukuma, S. Yoshioka, and H. Asakawa, “Wideband phase-locked loop circuit with real-time phase correction for frequency modulation atomic force microscopy”, Rev. Sci. Instrum. 82, 073707 (5 pp) (2011). 33) T. Fukuma, Y. Ueda, S. Yoshioka, and H. Asakawa, “Atomic-scale distribution of water molecules at the mica-water interface visualized by three-dimensional scanning force microscopy”, Phys. Rev. Lett. 104, 016101 (4 pp) (2010). 34) K. Kimura, S. Ido, N. Oyabu, K. Kobayashi, Y. Hirata, T. Imai, and H. Yamada, Visualizing water molecule distribution by atomic force microscopy, J. Chem. Phys. 132, 194705 (5 pp) (2010). 35) P.K. Hansma, B. Drake, O. Marti, S.A. Gould, C.B. Prater, “The scanning ion-conductance microscope”, Science 243, 641−643 (1989). 36) D. Pastré, H. Iwamoto, J. Liu, G. Szabo, and Z. Shao, “Characterization of AC mode scanning ion-conductance microscopy”, Ultramicroscopy 90, 13−19 (2001). 37) P. Novak, C. Li, A. I Shevchuk, R. Stepanyan, M. Caldwell, S. Hughes, T. G Smart, J. Gorelik, V. P Ostanin, M. J. Lab, G. W. J. Moss, G. I. Frolenkov, D. Klenerman, and Y. E Korchev, “Nanoscale live-cell imaging using hopping probe ion conductance microscopy”, Nat. Methods 6, 279−281 (2009). 38) A. I. Shevchuk, G. I. Frolenkov, D. Sánchez, P. S. James, N. Freedman, M. J. Lab, R. Jones, D. Klenerman, and Yuri E. Korchev, “Imaging proteins in membranes of living cells by high-resolution scanning ion conductance microscopy”, Angew. Chem. Int. Ed. 45, 2212−2216 (2006). 39) U. Kemiktarak, T. Ndukum, K. C. Schwab & K. L. Ekinci, “Radio-frequency scanning tunnelling microscopy”, Nature 450, 85−88 (2007). 40) J. A. Hilderbrand, D. Rugar, R. N. Johnston, and C. F. Quate, “Acoustic microscopy of living cells”, Proc. Natl. Acad. Sci. USA 78, 1656−1660 (1981). 41) U. Rabe, and W. Arnold, “Acoustic microscopy by atomic force microscopy”, Appl. Phys. Lett. 64, 1493−1495 (1994). 42) G.S. Shekhawat, and V.P. Dravid, “Nanoscale imaging of buried structures via scanning near-field ultrasound holography”, Science 310, 89−92 (2005).